Size: Female 2-3 mm; male 2-3 mm. 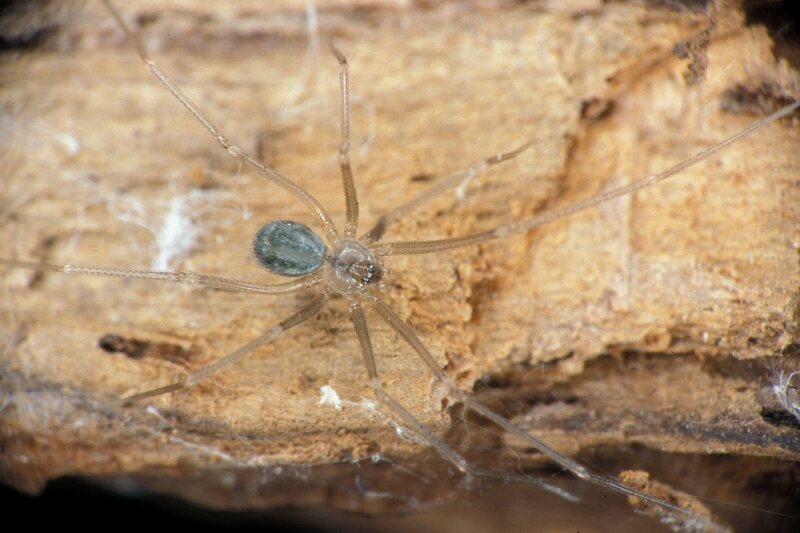 Family: Pholcidae C. L. Koch, 1851 (Cellar Spiders). Characters of family: The pholcids belong to the group of araneomorph, ecribellate spider families having 6 or 8 eyes and 3 tarsal claws. The anterior medials are smallest or absent in six-eyed species. The secondary eyes are arranged in two triads, which in some species are placed on tubercles. 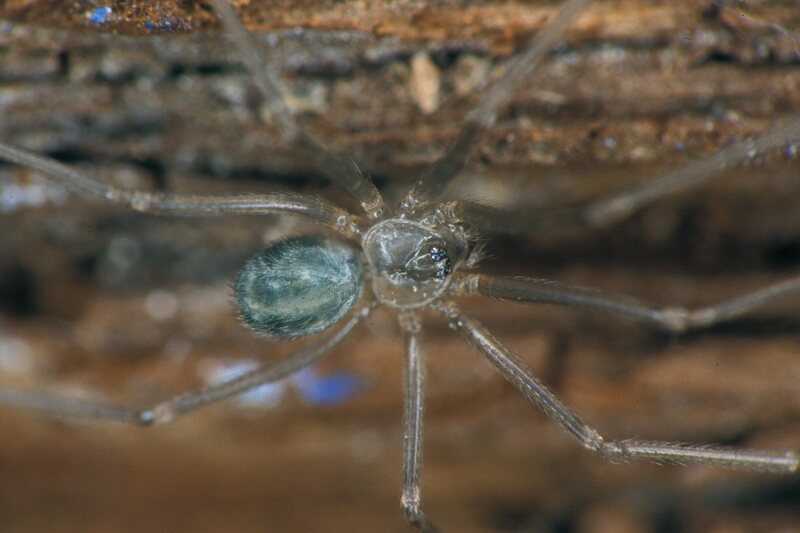 Other diagnostic characters for the family include the high, often concave clypeus of about the same height as the chelicerae and the usually very long legs with long and flexible tarsi with many pseudosegments. The carapace is subcircular with the head region often raised. In some species fovea is well developed. The sternum is convex often with sinuous sides, broadly truncated at rear. 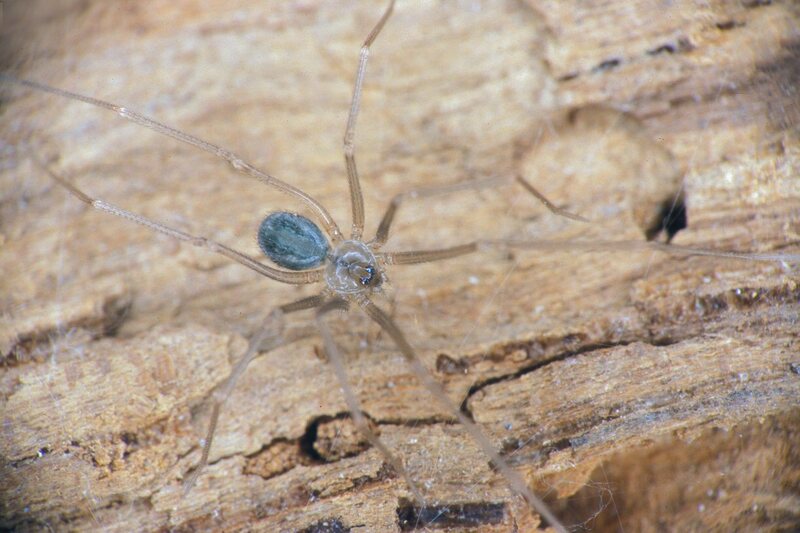 The chelicers are relatively weak and fused along the greater part of length. 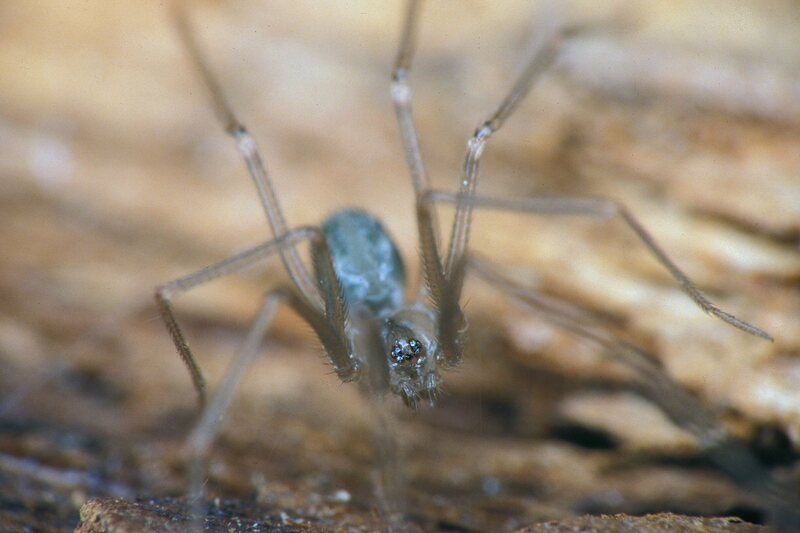 Males often have the chelicerae armed with teeth-like outgrowths. The labium is wider than long and fused with sternum. 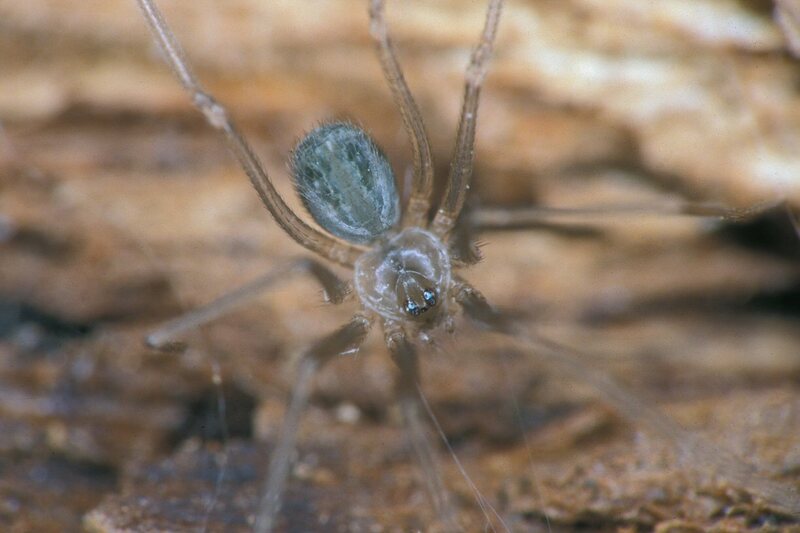 The female palp is small, slender and is not provided with a claw or tooth. The shape of the abdomen varies from globose to elongated cylindrical. The most common colours of the abdomen range between pale grey and darker brownish-grey. 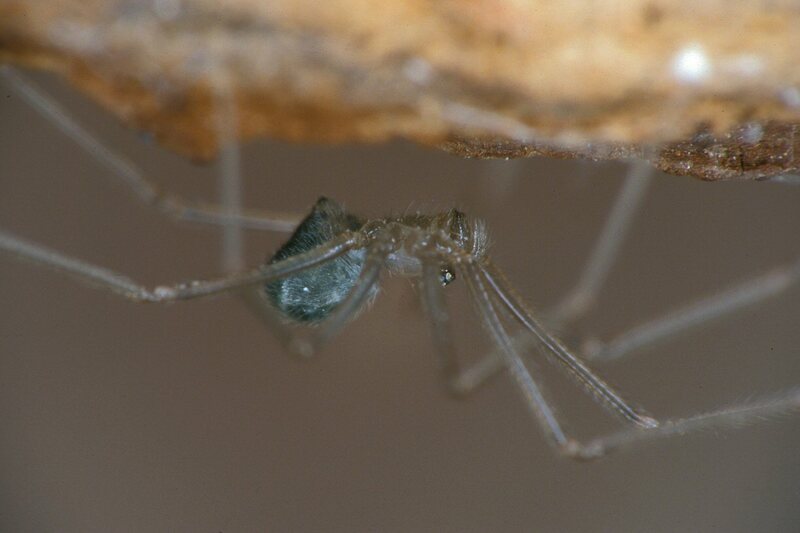 Psilochorus simoni has a bluish-green or blue abdomen. In some species a cardiac mark is clearly visible while in others this mark is just faintly darker than the ground colour of the abdomen. Many species also possess darker chevrons, bandings or blotches mainly in the midline of the abdomen. The abdomen of Holocnemus pluchei is reticulated very much like a giraffe. In some genera the spinners are situated ventrally and moved forward to a position near the epigastric furrow. There is no tracheal spiracle. Despite being haplogyne, pholcids do have the internal female genitalia protected by an epigyne like sclerotization. 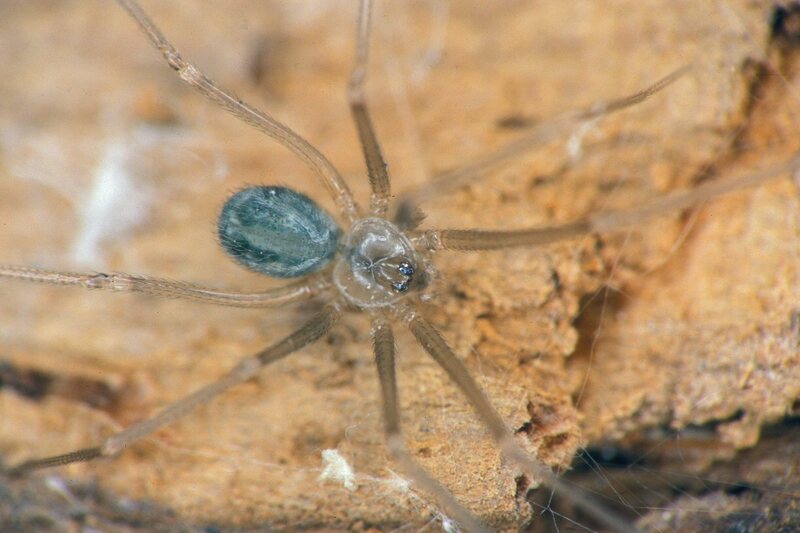 These are rather variable and allow pholcids to be identified from drawings of epigynes with the same ease as entelegyne spiders. The male palp is very complex having swollen palp segments and a large paracymbium.